bathroom wall art with a message. Personalized with the bathroom owner's name. reminds groggy morning readers to Brush; Floss; and Use soap. and coaches the clueless to Hang up the towel; Flush; and Wash their hands. Dimensions: 14"W x 18"H x 1/2". Personalized with a name up to 15 characters (includes spaces and punctuation). Colors: black chalkboard background or white background. 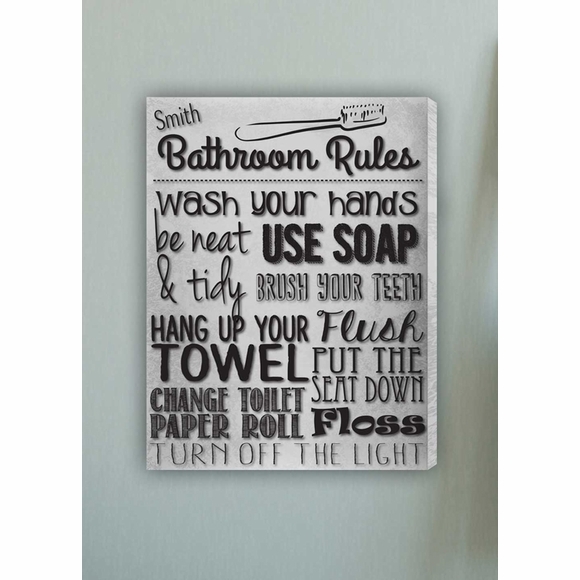 Personalized Bathroom Rules Canvas Print bathroom wall art with a message. Personalized with the bathroom owner's name.